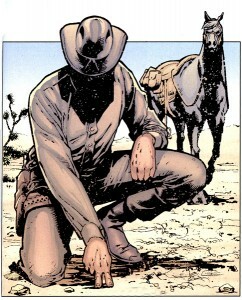 Amilton Santos, Andy Kubert, Darwyn Cooke, Dave Stewart, Elisabeth V. Gehrlein, James H. Williams III, Jimmy Palmiotti, Jordi Bernet, Justin Gray, Mark Sparacio, Paulo Siqueira, Rafael Garres, Rex Ogle, Rob Leigh, Rob Schwager, Tom Palmer Jr.
What makes a Western? The easiest indicator would be the location, or perceived location of the American expanse, untamed and legendary as a tester of the wills and grit of hard men and women. But many of the most famous westerns were shot in Italy, and/or take place in the American south or other locations. Some films, like Die Hard and plenty of other action movies, could feel like Westerns and are often referred to as such in excited discussions among film undergrads. Bullets Don’t Lie, the sixth book collecting the modern Jonah Hex ongoing and the 12th in our feature on the DC Western collections, sees the titular gunslinger across a variety of locals, including frozen Canada and arid Mexico. But Hex carries the west within him, in his ravaged desert of a soul. It’s safe to say that the story will always be a Western with such a character driving it. Without larger arcs (like a series such as Preacher or Starman), I approach each new Hex volume carefully – I worry that reading these all in a row may dilute the experience and I’ll soon be suffering from Hex fatigue (like some of you blog readers!) But moving through this section of the DC timeline has actually been very enjoyable. Even when it’s not the high point of the volume, each issue thus far has left me ready for more. 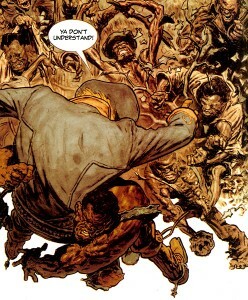 The book opens with a story penciled by Paulo Siqueira assisted by Amilton Santos‘ inking. Titled Red Mask, it’s another bounty for Hex to hunt down. Sequeira’s art is well defined and would be at home in a variety of titles and he does a gritty enough job for Hex. The man draws a swell set of choppers and there’s some impressive grinning and gritting of teeth on these pages. My only complaint might be that the artists decided to do an odd inverted ink splatter in the shadow areas, which after seeing in almost every panel seemed kind of hokey. I feel it may have worked better if reserved for one or two splash pages or pivotal moments. 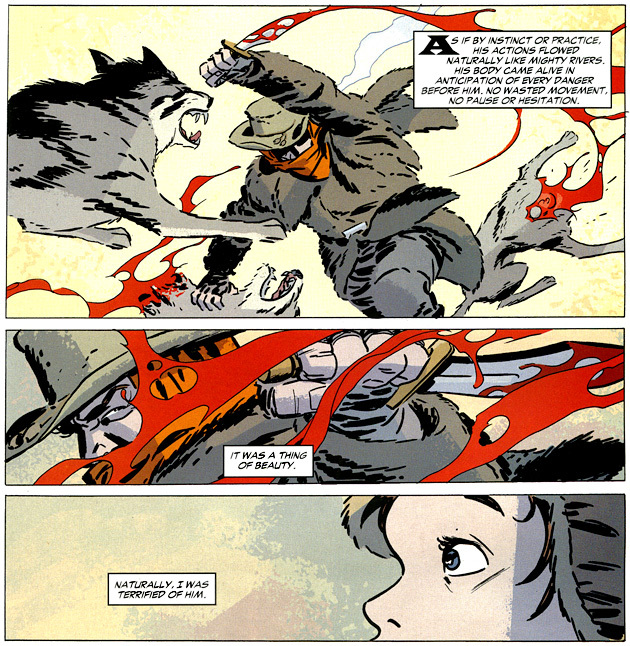 Jordi Bernet returns again for The Matador, a bit of intrigue south of the border. We don’t learn much new about Hex here, but in a relatively chatty issue he gets to swap views with smarmy and sultry characters, showing a bit of his best and worst traits. 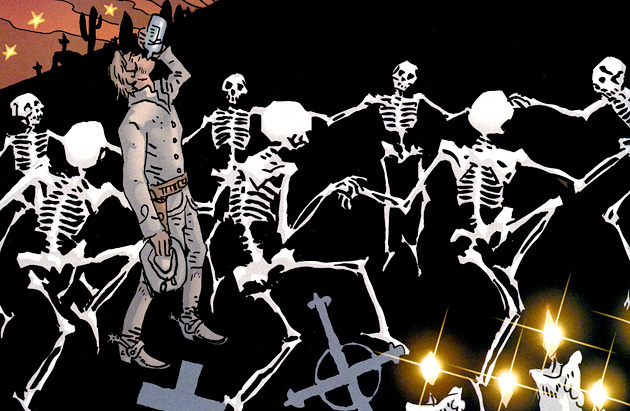 Plus there’s that marvelous day of the dead drinking binge depicted by Bernet above. The Hunting Trip finds Hex all the way up north, past the border and into a rough Canadian winter. I enjoy when the authors shift perspective, which they do here, telling this story from the perspective of a man remembering his encounter with Hex when he was a young boy. The viewpoint allows Jonah to be seen as a near-silent force of nature. 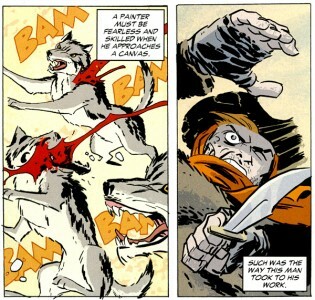 Darwyn Cooke, an artist I’ve learned to look out for, brings marvelous grace to mass violence over two main encounters, with the forces of nature and fellow man. He also excels at the quiet moments, with some beautifully stylized illustrations. A trail of blood leading over a snowy expanse, a small form waiting under the snow for the coming confrontation – these were particularly memorable. Outrunning Shadows is the highlight of the volume for those interested in the ongoing tragedy of Hex’s life. It seems even Hex can seek to run from fate at times, and this was one of those attempts. The issue is framed by an unidentified narrator, perhaps a chronicler. the voice is familiar from previous appearances and reminiscent of folk song legends. This particular tale occurs after Townkiller, which was collected in Luck Runs Out. It’s not the same artist and Mark Sparacio draws a relatively smooth faced Hex who seems much younger (this collection is perhaps the oddest so far in this respect, where Hex looks the most gritty and old in the story that takes place earliest chronologically). While visually he seems a tad off, the characterization here is perfect, with Jonah spitting out the saddest lines I’ve heard him say yet. Those hands (Palmiotti and Gray’s, I suppose) have brought Hex into familiar bloodshed at the start of A Crude Offer. While it’s just the lead, there’s some spectacularly laid out action to kick things off, winding into some strange events that give J.H. Williams III to show off some trippy sequences. This story is also accompanied by historical style narration, which seems a scholarly discussion on the nature of Hex’s role in history, particularly on the question of his attitudes towards race and the civil war. While I don’t feel anything new is revealed about Hex, this story brings much together to give a clear answer. The discourse is wrapped around a story of grievous misunderstanding and fatal results, along with a portrayal of the relatively young (and scarred) Hex as a tortured soul even at this early point in life. Garres art seems to show every conflicted thought upon Jonah’s face. The other characters receive the same amount of attention, their every thought, carrying evil or despair, showing in the contours of their visage. His treatment of form is almost psychedelic, stressing dynamic function and gesture along with rippling detail. While this collection continues to showcase high quality work, it didn’t feel as connected as previous volumes. 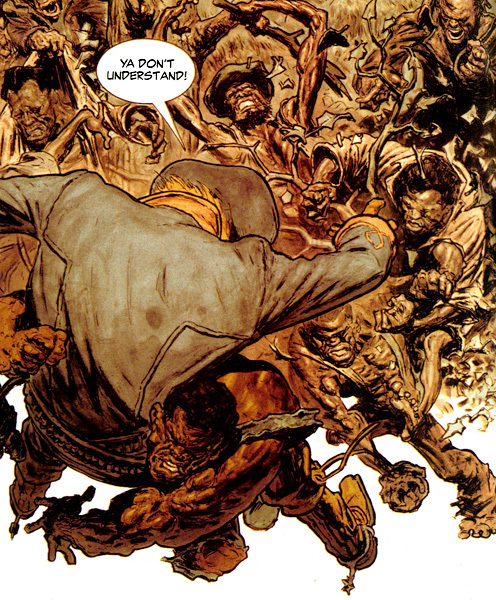 While the major strength of the Jonah Hex series is built on the character rather than a specific ongoing story, the theme here isn’t as strong as my reigning favorite, Luck Runs Out. The other stories were kind of standard. But in this run, even a “normal” Hex issue is a great comic. 4 out of 5. 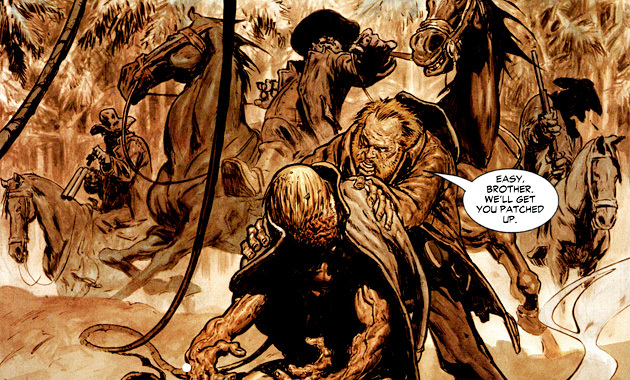 The Jonah Hex series continues to be one of the strongest books I’ve read in the past couple years. There are a couple stand out stories here and no disappointments. While not as absolutely essential as Luck Runs Out, this volume contains more than a few moments that no fan of the character should miss. Required for Jonah Hex. 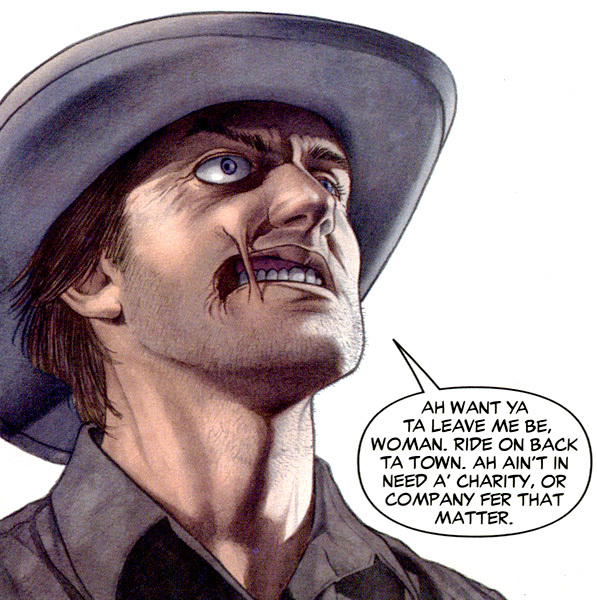 Like any DC Western, not particularly needed for understanding the main superhero oriented universe. 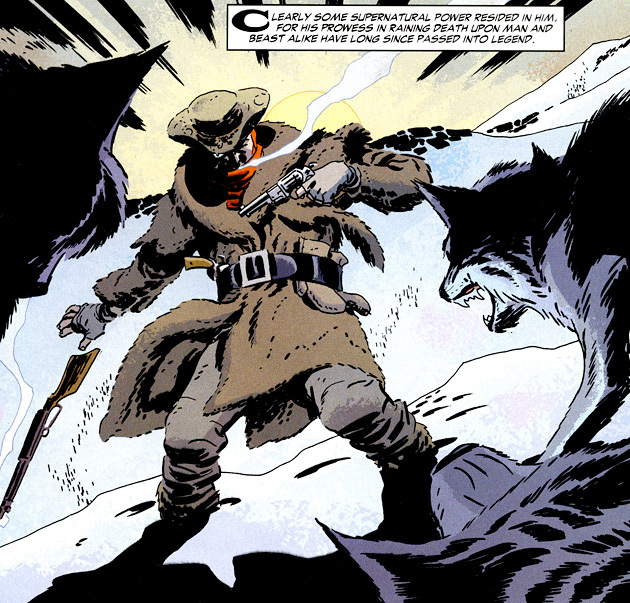 Follow that up with Jonah Hex: Face Full of Violence, Jonah Hex: Guns of Vengeance, Jonah Hex: Origins, Jonah Hex: Only The Good Die Young, and Jonah Hex: Luck Runs Out. 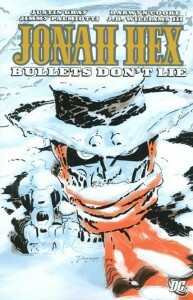 Following along with the DC Comics Reading Order, the DC Westerns and Jonah Hex‘s own list, the next book will be Jonah Hex: Lead Poisoning. Euhhh êtes vous sûr de ce que vous avancez ?